An s-video to RCA adapter converts an s-video signal into a composite video signal. In doing so, the luminance (brightness) and chrominance (colour) signals which are separate in s-video are combined into a single signal. This is not considered desirable and should only be used when there is no choice, for example, if you have an s-video output from a camcorder that you need to plug into a composite-only television set. If possible, try to use s-video connections all the way through. Having said that, in most cases the loss of quality when converting s-video to composite is barely noticeable. It is something which upsets technophiles more than average home viewers. S-video to RCA adaptors come in various configurations. Barrel connectors such as those illustrated on the right are handy to have in your kit as they can be used easily with existing cables. 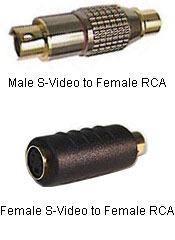 The female/female adapter is the most common type, allowing you to join a standard s-video cable and RCA cable together (both normally have male connectors). Adaptor cables are also available. These are like normal cables but have an s-video connector at one end and an RCA connector at the other. Note: You can also buy adaptor cables that take an s-video input and output it to two RCA connectors. One RCA includes the luminance, the other includes the chrominance, thus preserving the s-video signal. This type of adaptor can only be used with compatible equipment — you can't plug it into a composite video RCA input.